Thanks to all of you who have (so far) set aside 15 minutes to complete our most probing study yet on the State of Outsourcing in 2014 (and if you haven't yet done so, please click here NOW). 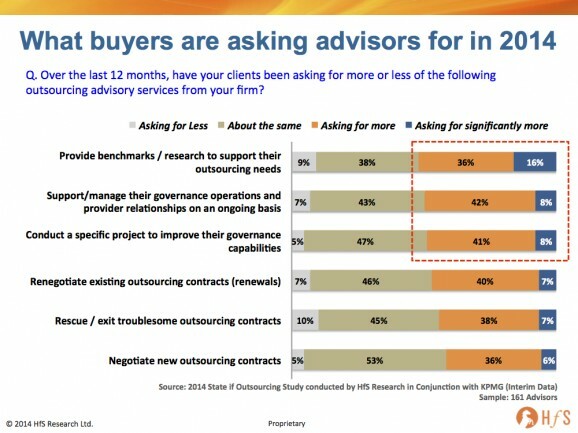 While a good number of clients still want more help with their negotiations, it's clear that most clients with experience of outsourcing also want an advisor who can stick around and provide ongoing support (or at least some project-based support). Advisors need to do research. 52% of advisors report that their clients have increased (many significantly) their thirst for research and benchmarks. Simply put, buyers want to be more empowered to understand the market, analyze their operations, and compare their performance with other firms. Hence, advisors need to have the ability to arm their clients with data and insight to help them. If they do not have any research, their clients will likely look elsewhere for help. Advisors need to understand how to support governance processes. 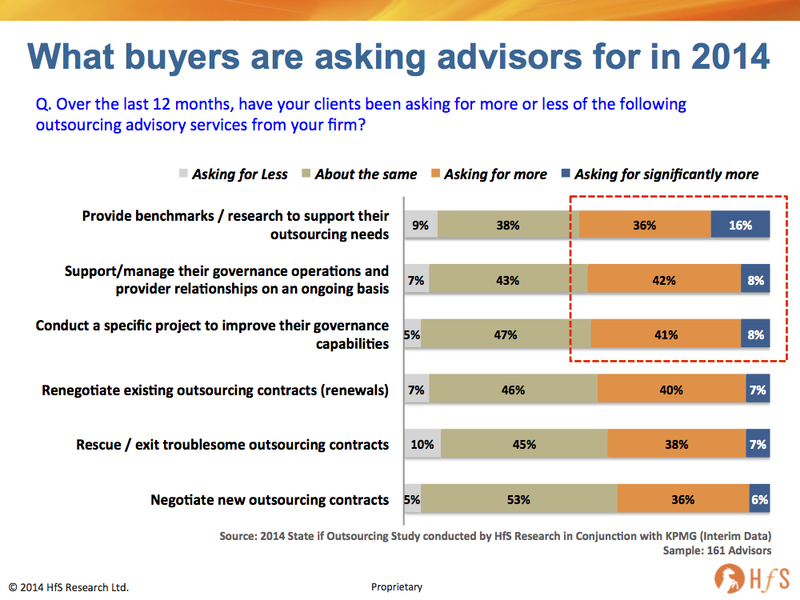 50% of advisors see their buyer clients wanting more help with governance and their provider relationships. This means providers need some advisors on staff who have lived the practitioner experience (with the battle scars to prove it) - they can't just reel out deal guys who used to broker contracts for service providers to craft governance strategies. There is no written rule book for governance - it's something that clients need to learn through good advice and real-world experience. Advisors still need to be good at negotiating deals. Buyer needs for deal help are definitely not decreasing - and close to half are wanting even more help. This means the deal guys can still get paid, but clearly need to up their game if they want to keep winning business with clients. Clients want to hire advisors which can be great at deals, but also great beyond the deal... and we've long been at pains, here at HfS, to discuss how clients need the same people negotiating the contract and actually living it after the ink has dried. Phil This is good data point and I see it happening as well in my client relationships too. What I have been trying to do is to perform a few comparisons, correlations, inverse relations with these patterns which are seeing in the market. My hunch is that industry itself is going through a major transformation in itself. Some of the proven methods of the past are not working anymore esp.whose neck to hold in case of fault. More and more risk is getting transferred to executioners. In a vendor-client scenario, vendors are looked as executioners and excellence is what is being expected now and nothing less than that. 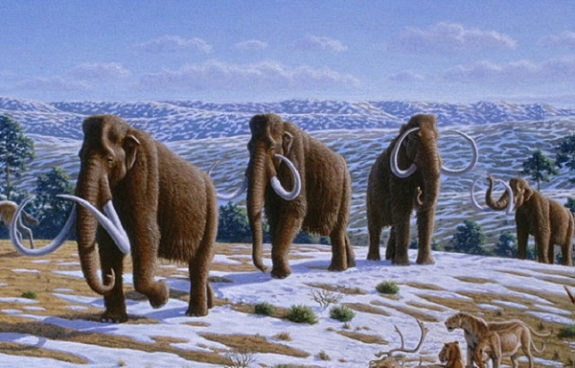 There are larger macro - economic changes which are also leading to these changes . I expect more strategic changes to happen in next decade or so. Look forward to your report and connect with you to share some more thoughts in this regard. Great data - and a great sample. Clearly shows the buyers are maturing and looking for more than deal negotiation from advisors. From what I am seeing, many buyers who only want the contract piece are using lawyers, and using the consultants more for the benchmarks and governance support. Phil - good insights as always. Re. your reply to Joanne Peters, perhaps a great additional question for the next survey might be to ask TPAs how much repeat business they are able to pick up in helping clients to implement the ideas proposed by them. This would provide an interesting comparison to the above chart and would, hopefully, provide useful input to ongoing HfS discussions on how clients need the same people negotiating the contract and actually living it after the ink has dried. Quality of services is becoming more and more differentiating. That means your advise must be truly based on research, data, proven practices etc. One addition though: I feel that in the end a truly successful outsourcing relationship can only be established if the company that is actually outsourcing will be able to govern his own business eco system. So as an advisor we have to make sure to not only be experts ourselves, but also to teach the client in becoming one. I think the 2nd topic ".... manage the governance and the relationship on an ongoing basis" is the one providing the biggest value add for the client. And this should be achieved with a highest possible level of industrialisation (automation and standardisation). Exactly that is the goal of our venture capital supported company offering online tools to efficiently manage outsourcing of application development (www.plixos.com). With universities we work on options to automate the monitoring of the relationship between customer and provider: http://bit.ly/1ldYtgZ. It is no easy tasks, though and still to be proven to work. Joerg.